The inventor said the idea itself was not new. He explained that difficulty had been encountered heretofore in attempts to store the dangerously inflammable hydrogen. 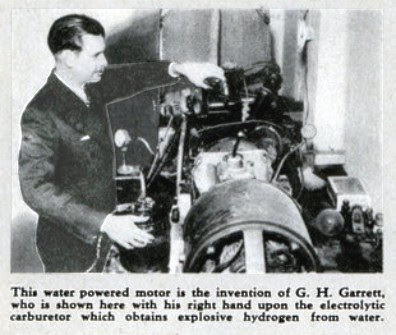 He claimed to have avoided that trouble by making and exploding the gas in the same process without a storage chamber in which the flames from the motor cylinders might react. . . .
News of Revolutionary 200 MPG Carburetor Prompts Oil Stocks To Plummet! This type of crap deserves no print space at all.